This outfitter is one of the major players in Quebec Caribou hunts, and we are pleased to offer their services. Located at headwaters of the Leaf River, this outfitter provides top-notch hunts and accommodations. Hunting season runs from early August to late September, and hunters are allowed to take two Caribou. 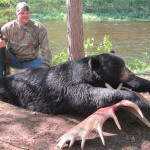 New Brunswick is known for it’s fantastic Black Bear population numbers. These high densities produce excellent success rates year after year. With over 200,000 acres of exclusive hunting territory, this outfitter offers top-notch service, great hunts, and wonderful memories. Advance baiting, selection of prime bait sites, extensive use of trail cams combine to provide a hunt that offers 100% hunter opportunity. Moose hunts on Newfoundland’s northern peninsula. 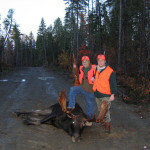 We are pleased to offer the services of Shepard Hunting Company, located in Northern Maine. Shepard Hunting offers both spring and fall bear hunts, and moose hunts for those fortunate enough to draw a tag in our Maine State lottery. 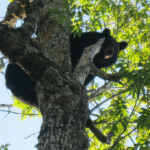 This excellent outfitter offers fantastic hunting for spring and fall bear, with both hound and bait hunts offered. Spring hunts are offered on privately-held tracts of land where competition is non-existent. 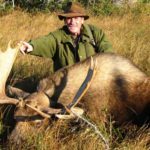 Maine offers a fall Moose hunt by permit only. There are two seasons, one in September and the other in October. Permits are drawn in mid-summer with a permit deadline in Mid-May. Drawn applicants are assigned a season, zone and bull or cow tag. Calling is one of the more successful ways of shooting a big bull. It is also the most exciting. Both bulls in the photos on the right was called to within thirty feet of the truck. Fins & Furs Adventures and/or the outfitters we work with assume no responsibility for losses due to weather, delayed flights or acts of god.